10 and 20 MHz B-scan, 25 MHz and 50 MHz UBM, and biometry probes. 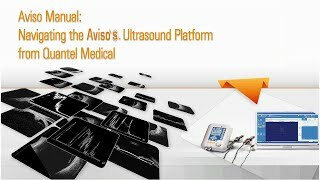 Aviso A/B delivers high resolution digital imaging. Its high signal to noise ratio helps differentiate the finest structures at all frequencies. Examination is fast and easy using the Aviso software via touchscreen remote or the computer terminal. Customizable multiple choice database search criteria. 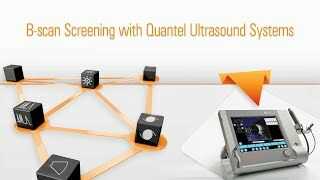 Quantel Medical develops and manufactures all B probes commercialized with its ultrasound units. All probes use the electromagnetic field technology to control the transducer movement. This unique technology ensures a faster scanning process and increased image resolution. This technology allows a higher comfort of use with less vibration and a probe lighter in weight. For UBM probes, Quantel Medical was the first company to introduce the linear technology. 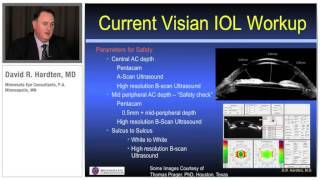 Linear scanning offers the greatest signal intensity, providing superior anterior chamber image quality as the probe is always perpendicular with the tissue interface of interest. Resulta clara la relevancia de la ecografía de muy alta frecuencia en el estudio de los glaucomas primitivos de ángulo cerrado. Esta técnica suele ser de utilidad para el diagnóstico en diversos casos de cierre angular secun-dario. Se trata de una técnica de exploración muy rigurosa que requiere formación y práctica. 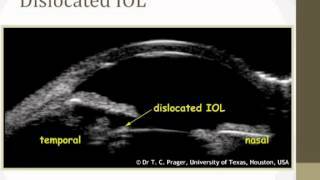 The importance of very high-frequency ultrasound in the study of primary angle-closure glaucoma is obvious. It often contributes to the diagnosis in several secondary angle-closure situations. It is a very thorough examination technique which requires training and practice. 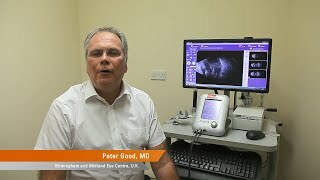 UBM, or very high-frequency ultrasound, uses transducers, the frequency of which is higher than 20 MHz, whereas the usual standard in ocular ultrasound uses probes of 10 MHz. Charles Pavlin first described the use of ultrasound for the anterior segment in the early 1990s. This single centre observational study aims to clarify the differences between single and double eyelid structures in Asian population. 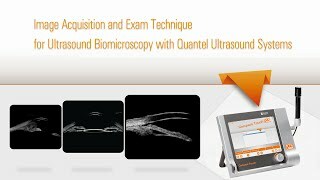 UBM images made with Quantel Medical’s Lin50 probe correlate both quantitatively and qualitatively with anatomic structures. By J. James Thimons, O.D., F.A.A.O. Historia de cáncer de mama desde el 2008. Carcinoma ductal invasivo (idc),norrin-gham´s G II. Tratamiento quirúrgico: mastectomía derecha con resección de cadena linfática y tamoxifen de 20 mg durante 5 años. Paciente que presenta sensación súbita de cuerpo extraño en ojo izquierdo al pasar caminando cerca de donde pulían una moto. Con posterior pérdida progresiva de la agudeza visual por el ojo izquierdo de 6 meses de evolución por lo cual consulta. La anomalía de Axenfeld – Rieger es una enfermedad de herencia autosómico dominante hasta en el 70% de los casos, aunque presenta una variable expresividad, con una considerable heterogenicidad genética sugerida por la gran variedad de anomalías cromosómicas encontradas. Hasta un 60% de los casos han sido caracterizados con los genes PITX2(4q25), FOXC1(6p25) y genes no identificados en el 13q24, 16q24 y cromosoma 11. 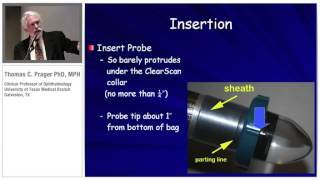 Case presentation with the new 10 MHz B-scan probe. Case presentations with the new 10 MHz B-scan probe. 10 MHz Probe for eye and orbit examination. Automatic biometry readings obtained from a B mode image allowing axial length measurements for difficult to mesure long eyes or posterior staphyloma. 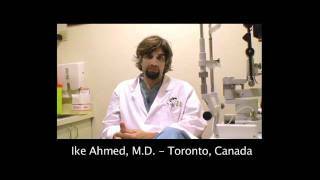 The magnetic 20 MHz probe for retina is a unique diagnostic tool for high resolution posterior pole and retinal periphery imaging. the distinction between the retina, choroid and sclera as well as the vitreoretinal junction have never been finer. 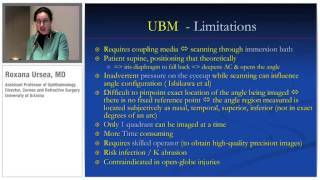 25 MHz UBM probe offering linear technology designed for anterior chamber imaging and cataract specialistes. 50 MHz probe reveals what you can not see with OCT alone, enabling the operator to visualize the structures located behind the iris such as ciliary bodies, the processes and lens zonules. Linear scanning offers the greatest signal intensity, providing superior anterior chamber image quality as the probe is always perpendicular with the tissue interface of interest. Contact and immersion techniques compatible. Ultrasound propagation velocity adjustable per segment (anterior chamber, lens, vitreous) and IOL and vitreous material. ©2019. Quantel Medical, Aviso™ is a registered trademark of Quantel Medical. All rights reserved.